Finally there's a cheese magazine for the masses. It's called Culture: the word on cheese and it's a great addition to cheese shops, gourmet food stores, wine/beer stores, and of course, the magazine rack at Borders. So far there's only been one issue published so my review of the magazine is based on very little data. The first issue has blue cheeses as the focus and had a centerfold about Winnimere, and thus I must give them the award for "best first issue of a magazine ever". What I like about the magazine is that it makes cheese very accessible to everyone. It's a great introduction to the cheesy world for beginners as well as people in the industry. This magazine puts you in touch with cheesemakers from all over. The premiere issue has stories on Bob Wills from Cedar Grove Cheese in Wisconsin (he has a Ph.D. in economics and a law degree), Ivano Bellodi an Italian cheese master, a section on a tiny corner of Ireland that makes ridiculously good cheese, and of course the brothers of Jasper Hill Farm. There's even a section with recipes from Chef Jennings from La Laiterie at Farmstead, a shopping section, and a what to do when you're in ______. The blank space in this issue was San Francisco. One can only hope that they'll incorporate different parts of the country in future issues. While I like everything about the magazine from table of contents to the retailer directory I do have one gripe. 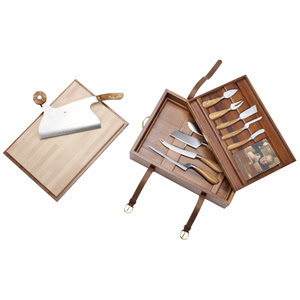 On page 16 they showcase a lovely set of stainless steel and olive wood knives from Tuscany that come in a carrying case that doubles as a cutting board and serving tray. It retails for $2000. Bastards! Every time I flip through the magazine the knives call to me. "Cheeeeesssssseeeeeeewench. Oh Cheeeeeeeessssseeeeeewench. Buy us. You know you want to. Imagine how smooth and supple our olive wood handles will feel in your powerful and yet delicate cheese grip. Cheeeeeeeeesssssseeeewench." Oh, wow, those knives are GORGEOUS! A hard siren song to resist, for sure! I've been exceedingly disappointed with Culture magazine. They were dreadfully slow to send out my first copy, were rude when I called about it, and are shorting me one issue. Instead of the advertised full year of 4 issues which I paid for, I'm getting 3. No amount of emails or phone calls will correct their error. My advice: if you like the magazine, buy it on the news stands. DON'T subscribe, as they treat their subscribers the way a small child views Limburger cheese. Cheese is Alive, and Milk is NOT ORANGE.